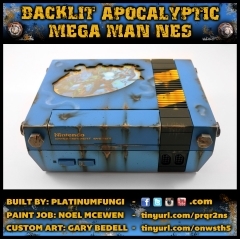 "Currently on display at Gallery iam8bit in Los Angeles, California, I present to you the ‘Backlit Apocalyptic Mega Man NES’! This is a very unique collaborative art piece. I teamed up with artists Noel McEwen and Gary Bedell to bring this one to life."